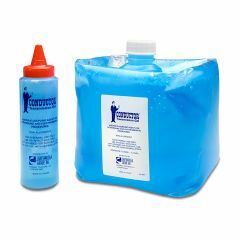 Electrode Lead Wire Set - 24"
The 1.32 gallons (5 liters) of Conductor Ultrasound Gel comes packaged with a 8.5 oz container for easy refill. A hypoallergenic gel that is non-greasy, doesn't stain, and will enhance conductivity. Choose either 5 liter jug, carton of 8.5oz bottles, or cases of each. Great price for alot of product. Great product, works very well with my ultra sound machine for foot pain. Easy to use. Non-fragrant for procedur. stores well. ships/delievers quickly. We use this product in our medical spa for various laser procedures and medical procedures. I like how it doesn't have a strong smell and stores great so ordering in big shipments is never an issue. Shipping is always very quick and arrives in a timely manner.The only trouble we have is we order the large cubes so that we may refill the smaller bottles and as it gets low in gel it becomes very difficult to remove the residual gel which makes me feel wasteful when i see how much is still left. Is this conductor ultrasound gel salt-free and can it be be used as electrode gel? From the bottle: "Aqueous Coupling Agent for Ultrasound and Electromedical Procedures. Water soluble, non-greasy ultrasound and electrical coupling gel. Will not irritate tissues or damage the ultrasound applicator. Spreads easily and evenly and is an efficient coupling gel for diagnostic and therapeutic procedures. Non-allergenic, for external use only, use on intact skin only, not intended for surgical use, not for use with defibrillators." Nothing on the bottle says anything one way or the other about salt, though I doubt there is salt in it because our ultrasound machine has a metal head and we've had no rust after 5 months of near-daily use.